Heavy D's final tweet: "Be inspired"
Heavy D performs onstage during an event in Las Vegas on June 15, 2011. Rapper Heavy D, known for such '90s hit as "Now That We Found Love" and "Got Me Waiting," has died, a rep for the musician confirmed to Access Hollywood. Dwight Arrington Myers, 44, was taken to Cedars-Sinai Medical Center in Los Angeles after being found struggling to breathe in the hallway of a Beverly Hills apartment complex. Police were called to the 400 block of North Maple Drive at 11:25 a.m. on a report of a man who had collapsed in the walkway of a building, Beverly Hills police Lt. Mark Rosen told City News Service. The man was found conscious but struggling to breathe. He was taken to the hospital, where he was pronounced dead, Rosen said. 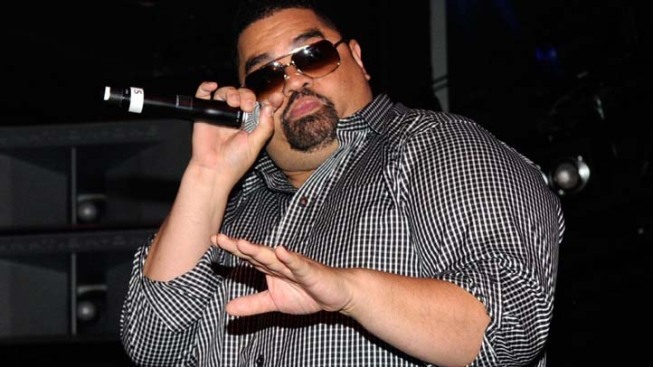 Heavy D tweeted about 12 hours before the reported incident, writing "Be inspired." Heavy D rose to fame in the 1980s and 1990s with Heavy D & the Boyz. In October, he appeared at the BET Hip-Hop Awards, performing a medley of his hits, including "Nuttin' But Love," "I Want Somebody" and "Now That We Found Love." He also gained fame for performing the theme songs for the show "In Living Color." He also performed the rap portion of Michael Jackson's single "Jam." The rapper also had a successful string of appearances on television and in films, including "Life," "Big Trouble" and "The Cider House Rules." He has a cameo role in the current film "Tower Heist."